I read a lot of blogs. They run the gamut from fashion and food to party planning, interior design, and finance. Up until now, when I read something I like I star it so I go back to it, but I have reached the point where I star so many blog posts it takes me a while to find specific starred posts I am looking for. To remedy this problem I am working on getting a Pinterest page up and running (I will let you know when we are set), but I have also created a My Favorite Things page so I can share all of the amazing things I am reading and you can enjoy them too. 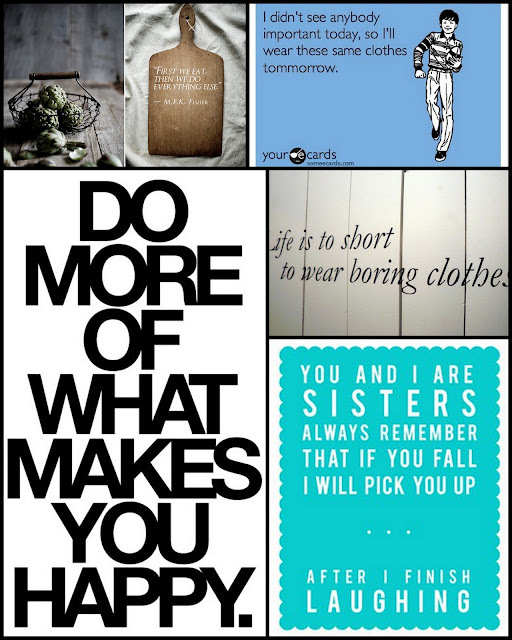 Tonight I thought I would post some quotes I have read recently that I think are funny or sweet. Hope you enjoy! For the record, I know the quote on the right-hand side in the middle spells "too" incorrectly but I liked the quote so I decided to include it anyhow.